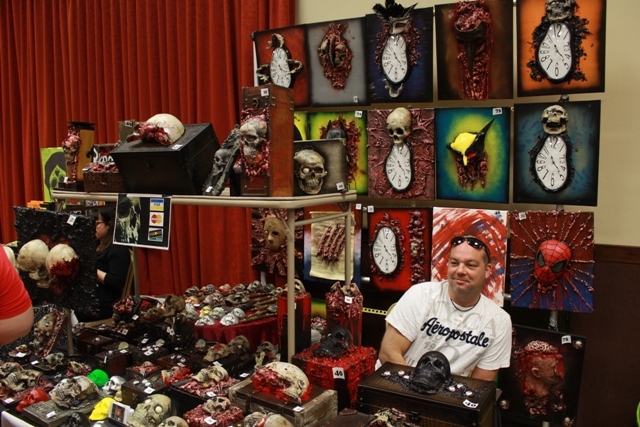 2013 “Days of Dead” Indianapolis: Creative Dealers and their Ghastly Goods! 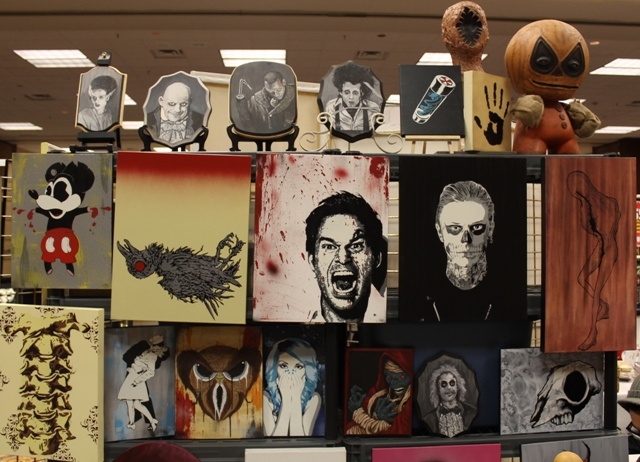 An interesting thing about Days of the Dead Indianapolis; the set up has remained relatively unchanged since the first year it began. If you’re an annual visitor (as many of these faithful attendees are), it doesn’t take long for you to get your bearings straight. 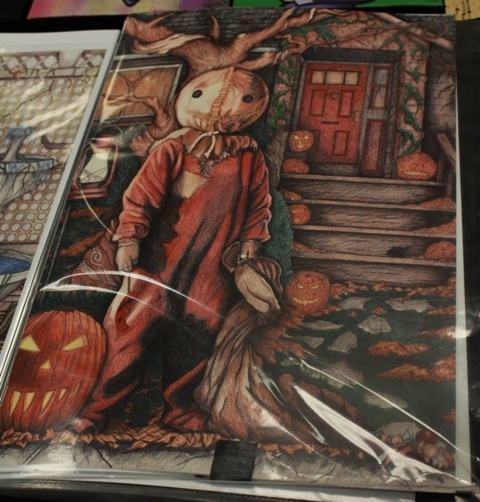 I’ve noticed with horror cons; the majority of vendors are now private artisans offering their own original works. 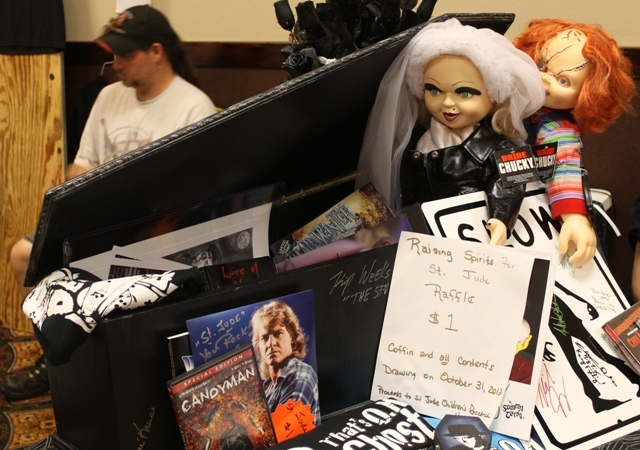 This takes many different forms including (but not limited to) killer toys, T-shirts, candy, and jewelry. I actually prefer these kinds of things as opposed to mainstream merchandise and, let’s face it, in the world of eBay it provides guests more of an incentive to spend money. 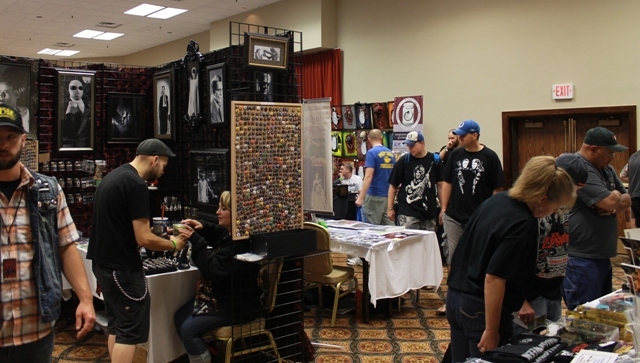 At a horror convention, the competition for cash can be daunting and I always feel that private artists should be supported whenever possible. For these talented folks it’s usually the labor of love (as it is for Russ who is also an artist ) and they’re often lucky to break even with their table fees let alone turn a profit. Where else but a horror con can you find killer sweet potatoes? Due to the pricing and appeal of celebrity encounters, this is no easy feat. 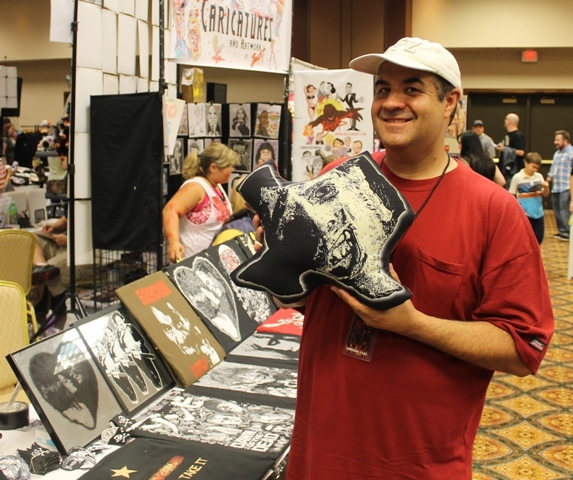 I’d heard from many dealers at last March’s Horrorhound Weekend that the autograph price gouging from The Walking Dead cast made for a bitter harvest. With those same celebrities (along with a host of other expensive names) appearing at the upcoming Fright Night Film Fest, I’m thinking those dealers will also be facing an uphill battle. 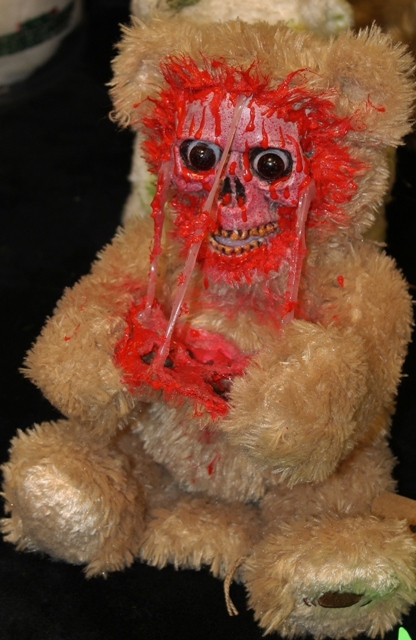 One of the artists featured at Days of the Dead had taken everyday stuffed animals and given them a hellish twist via skulls and makeshift blood. 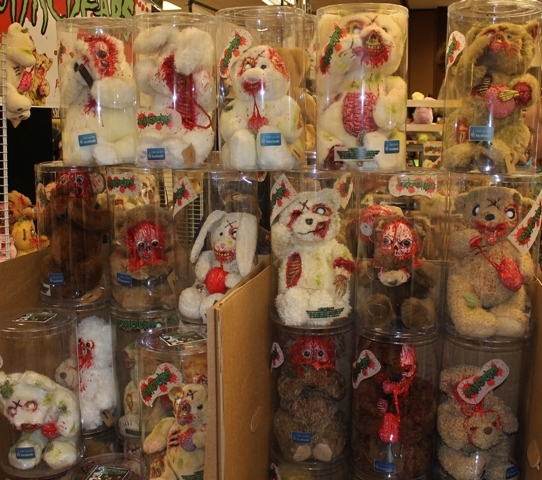 I’d seen these guys at the last Days of the Dead in Chicago which wasn’t surprising since they live near my Windy City. Back then I’d spied a zombie giraffe I liked but didn’t buy it. It bugged me later since, for some inexplicable reason, I seem to be on an evil toy kick lately. 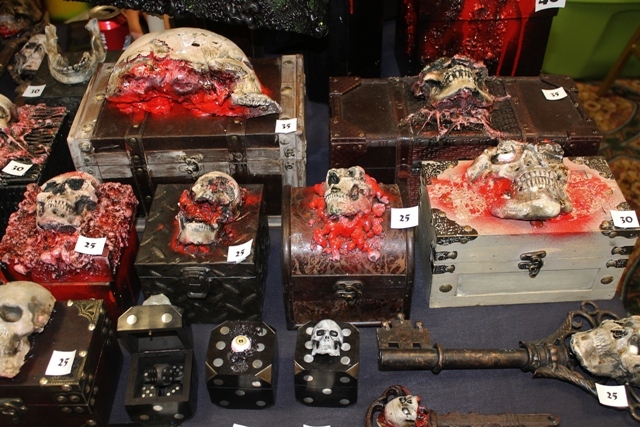 Actually, skulls seem to be the new staple in horror arts & crafts these days. 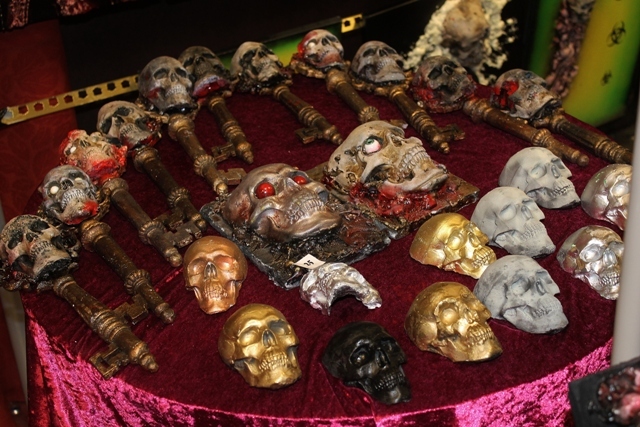 There were several different dealers offering macabre items featuring bones…both human and animal. One vendor also sold fleshy remains. 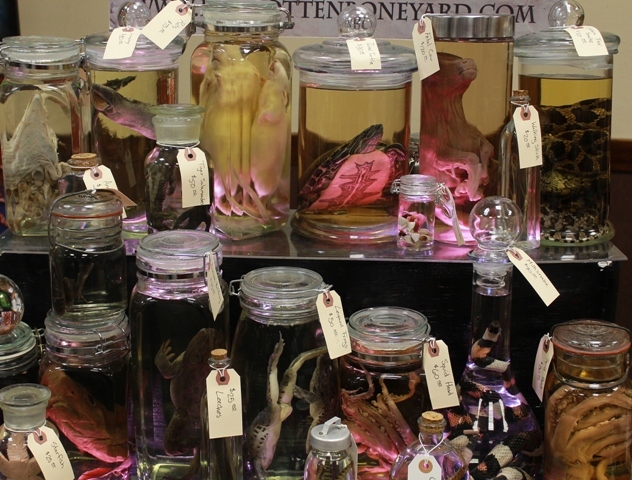 Are you looking to purchase specimens of squids, reptiles, or cow fetuses? Then look no further than the Forgotten Boneyard! What to buy the person who has everything! Now don’t get me wrong, from a zoo perspective I thought some of their stuff was pretty neat. In fact it was a lot like an exhibit I saw recently at my local Natural History Museum. I just can’t imagine having one sitting on my shelf at home and staring at it…while its staring back at me! For those with a sweet tooth, some unique candies were being offered at a table helmed by an attractive woman, covered in tattoos. Her name was Andrea Smith who’s a “chocolateer” by trade but also runs her own company, Chocolate F/X on the side. 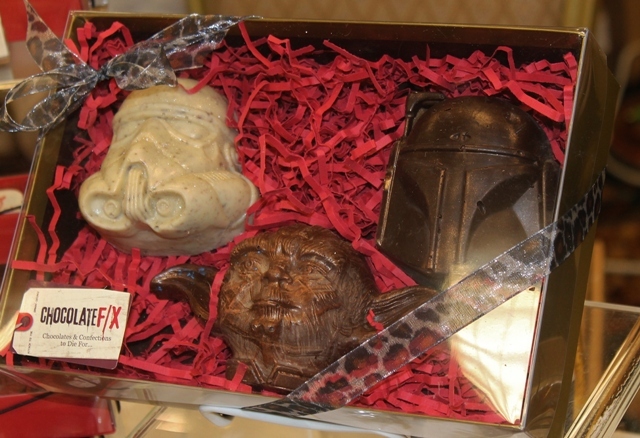 Andrea, who loves both horror and sci-fi films, created some homemade chocolates that almost look too good to eat! 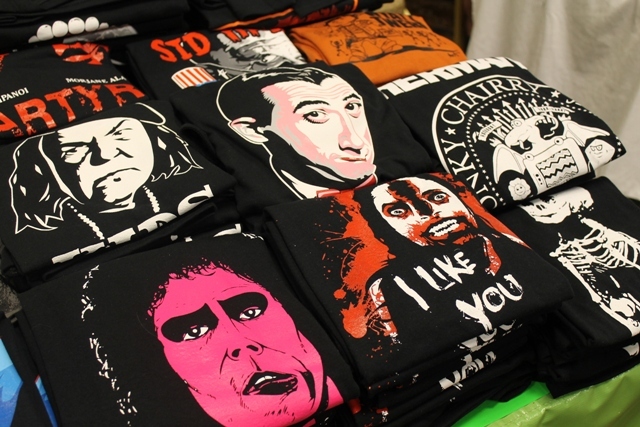 These would include characters from STAR WARS as well as iconic slashers such as Freddy, Michael Meyers, and Jason Vorhees. If you’re thinking about hosting your own genre inspired party, or want to show that special geek in your life just how much you care, visit her site by clicking HERE. 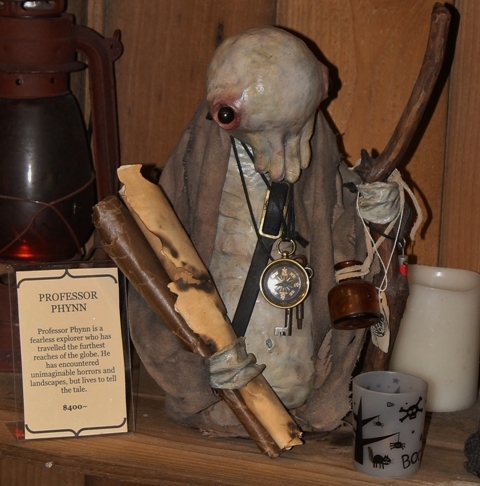 Some of the classier, though no less eerie, handmade items offered were courtesy of The Shadow Farm. Crafted by the creative mind of David Schilling (a.k.a. 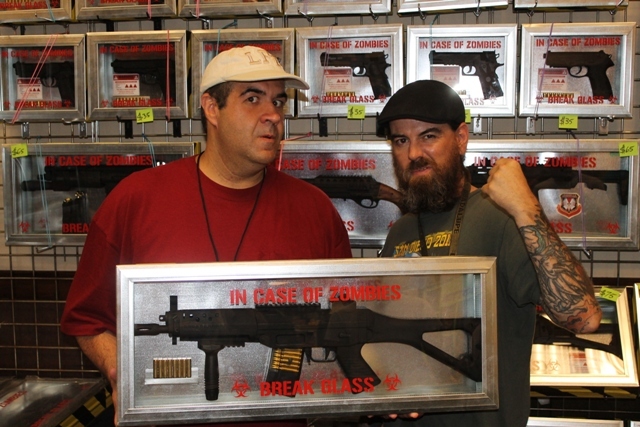 “Dave of the Dead”) this Terror Dave wasn’t around when I stopped by but his wife and son were. 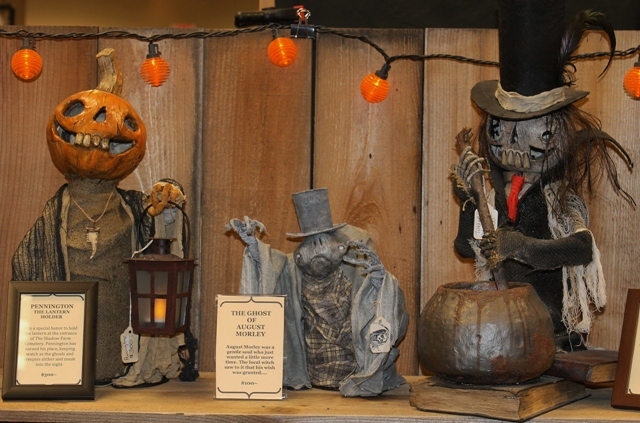 I complimented his work and commented that they must have one hell of a set up during the Halloween season. “Yeah,” she said. “The monsters have overtaken our furniture.” In my world, that’s not such a bad thing. 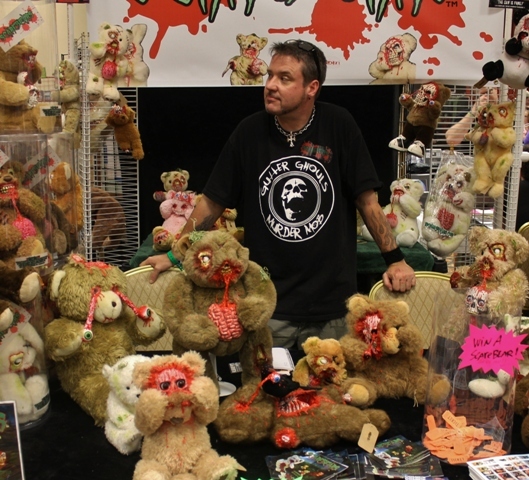 Killer teddy bears have been making there rounds at many conventions of late. Terror Dave pal, Lee Howard, and his amazing Quiet Room Bears were always some of our favorites. 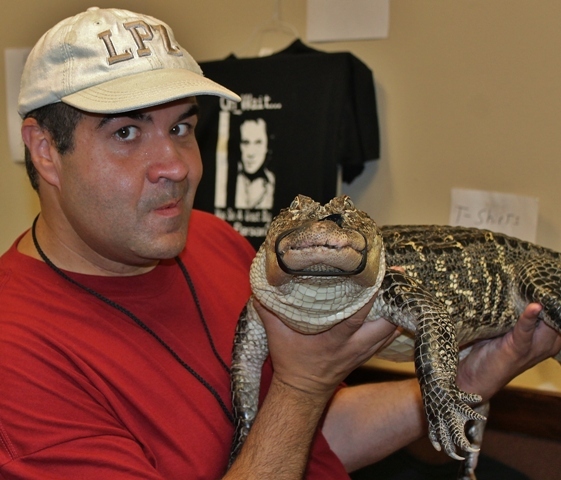 Lee’s from Canada and we were fortunate to have met him back in 2010 during Rock n Shock (story HERE). I hadn’t seen him since and was excited to learn he was not only returning to The United States, but at an an event close to me. 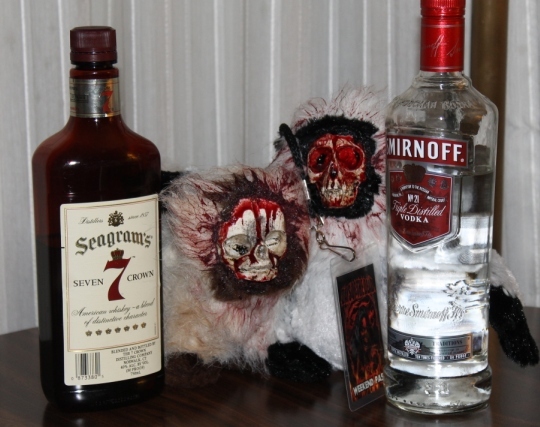 Unfortunately, US customs made things too difficult for him to bring his gruesome creations over the border (which was the whole point of the trip). I’m hoping things will improve and he’ll be able to pull off an appearance at the upcoming Chicago show. Lee’s absence, however, should not suggest that evil bears and their ghastly cousins didn’t receive Days of the Dead representation. 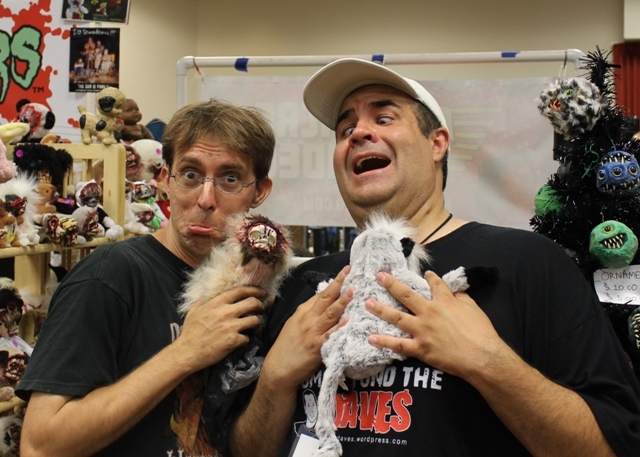 Enter my absolute favorite discovery at this event…my first glimpse at Jay Langley’s Scarebears! In fact, there was something about them that’s had me pining for one ever since. 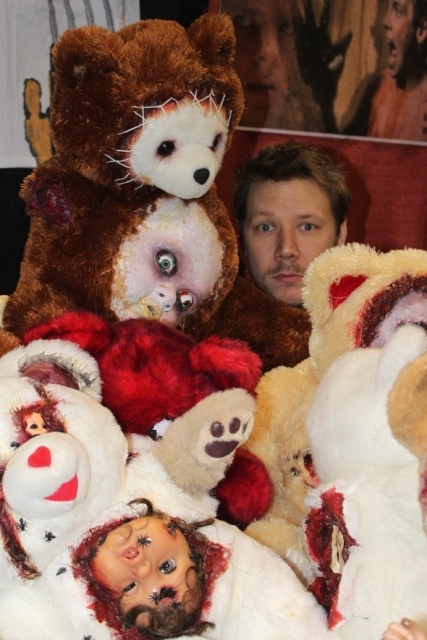 Jay Langley and his Scarebears! Ever since I returned home I’ve been trying to figure out what it is about these damn things I love so much. I’m thinking it’s because I’m a big fan of killer toy movies and the eyeballs on these guys remind me of one of my favorites – the ’80s film, Dolls (not sure why but they do). Whatever the reason, I think they’re amazing and, mark my words, someday one (or more) will be mine! 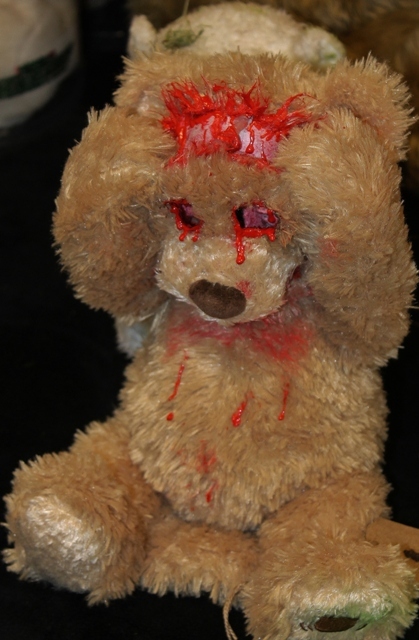 One that particularly stood out was an animatronic Scarebear emitting a childish laugh…while routinely removing its face! Now I don’t care how weak your stomach is, this is just plain cool! 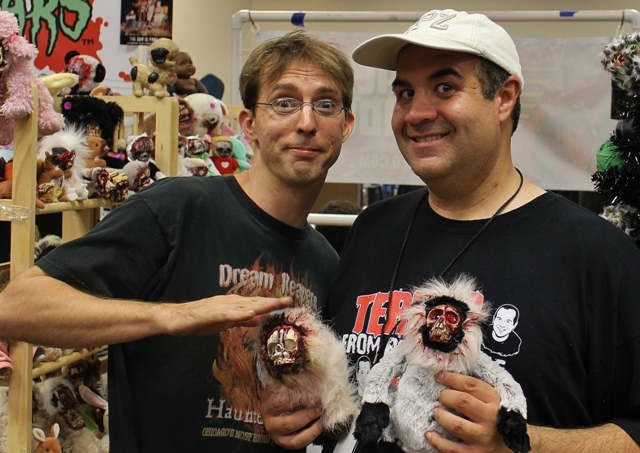 Scarebears will be showing up at Flashback Weekend here in Chicago as well as the Windy City’s Days of the Dead in November. So, if Lee ends up making it out here, I may need to take out a small loan…or pray for the impossibility that one of my friends shows up intent on getting me the perfect Terror Dave Christmas gift. Either way, I’d love to do a feature exclusively on the Scarebears and hope their Chicago visits will provide more detailed insights. Amongst the goods was also a booth featuring live animals you could hold for a small fee. I talked to the guy running the stand and he said he was from Rhode Island. I told him I had friends at their local Roger Williams Park Zoo but, while agreeing it was a great place, he stated that he had no affiliations with them. 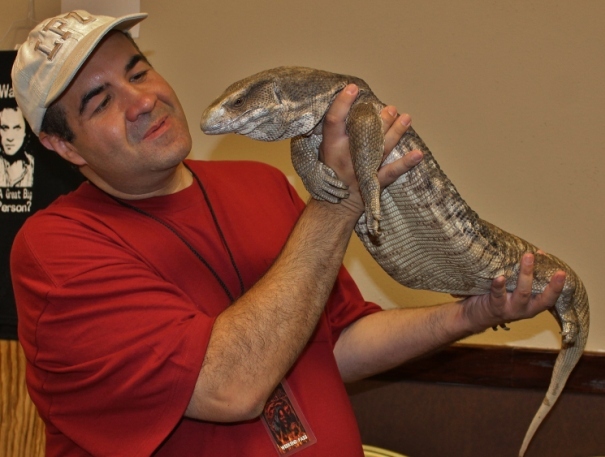 In his collection was a beautiful 12 year old monitor lizard and a young alligator which I couldn’t resist holding. 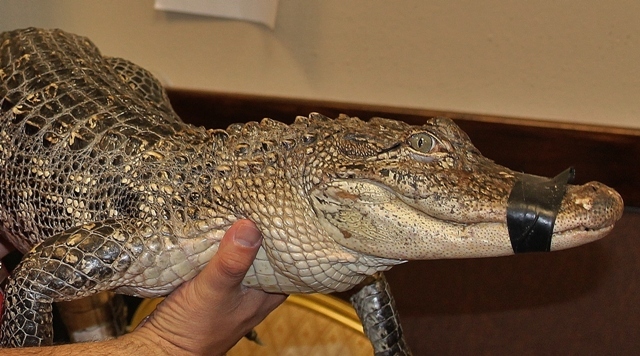 They also offered large frogs and tarantulas for photo ops too. I always have mixed emotions about this kind of stuff as I wonder how the animals feel about being handled all day. I noticed there was a lot of that going on during my recent visit to The Little Boots Rodeo (covered HERE) and I wasn’t entirely thrilled with what I’d seen. In fact there was a baby bear there that I wanted to grab and rescue like Animal Planet’s version of Not Without My Daughter. At least these animals appeared healthy and showed no signs of stress. 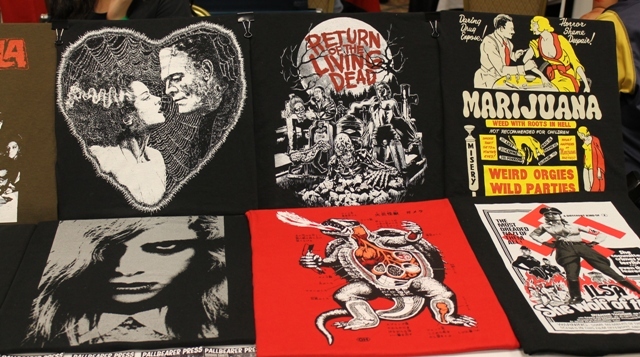 Cool designs by Atomic Cotton! 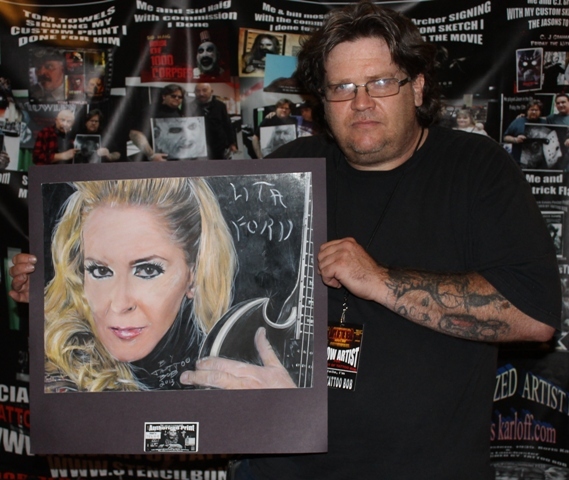 Artist Mr. Tattoo Bob and his amazing Lita Ford creation! 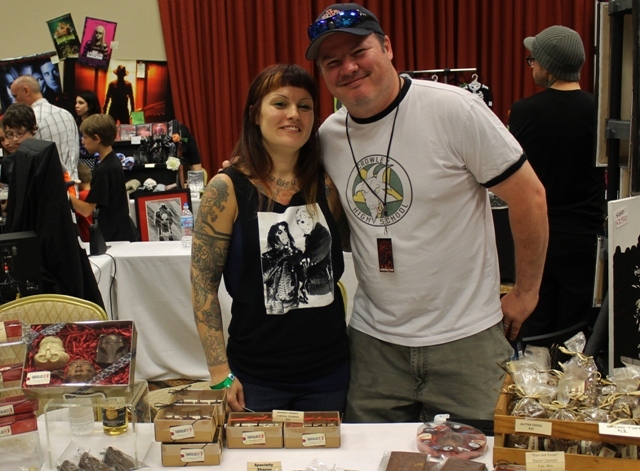 St. Jude knows that Horror Fans are actually the nicest people out there! Daughter of the Ghoul and Razorthroat Niegro. 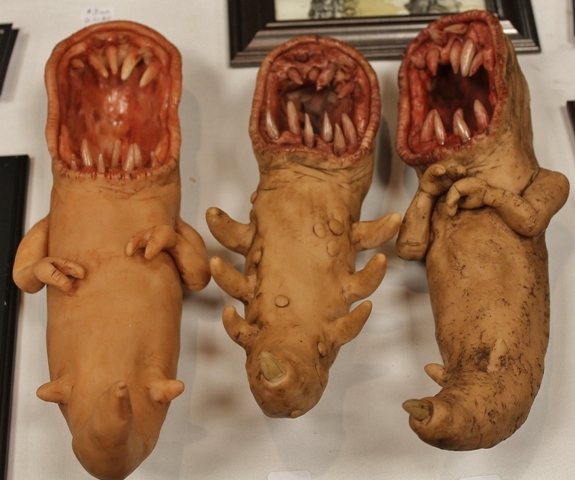 Coming up next…THE THING Reunion! This entry was posted in Convention & Expos, Masks, Models, & Props! 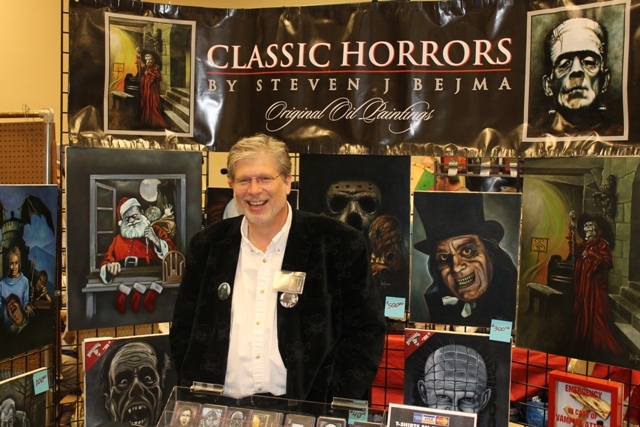 and tagged Chocolate F/X, DAYS OF THE DEAD, Flashback Weekend, Forgotten Boneyard, Horror Convention Vendors, Jay Langley, Jordan Ladd, LEE HOWARD, QUIET ROOM BEARS, Roger Williams Park Zoo, Scares the Care, Skulls, St. Jude, Steven Bejma, The Shadow Farm, Trick r Treat. Bookmark the permalink. ← Pacific Rim: Big Godzilla-like Thrills for an even Bigger Screen!